Cook pasta in plenty of salted boiling water, according to package instructions, for approx. 8 –10 min. until al dente. Drain, save some of the pasta water and set aside. Trim wooden ends of asparagus. Then, cut into bite-sized pieces at a slight angle. Zest lemons and squeeze out the juice. Pick thyme leaves and chop finely with the dill. Fry asparagus in some olive oil for approx. 8 – 10 min. until tender. Season with 2/3 of the lemon zest and juice. Add cooked pasta and thyme leaves to pan and toss. Season generously with salt and pepper. Combine fresh goat cheese with dill and the remaining lemon zest and juice. 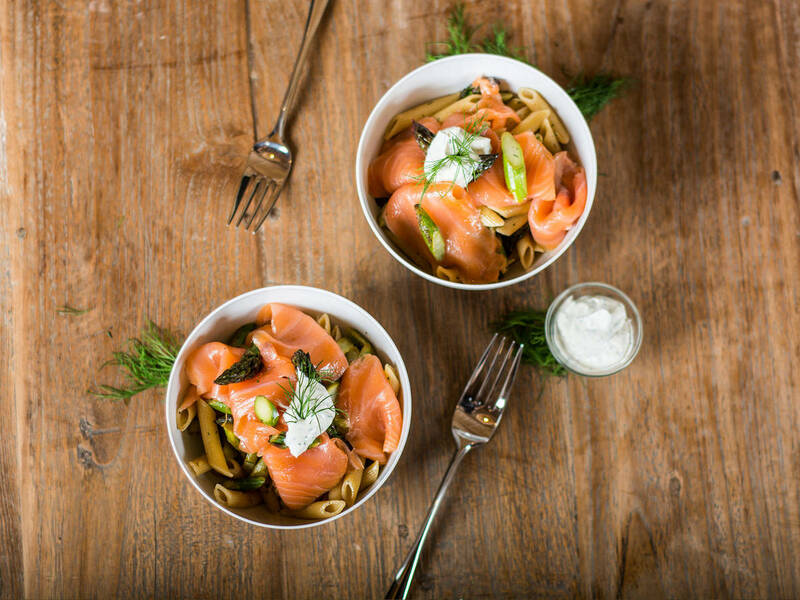 Top pasta with a dollop of the cheese and add smoked salmon on top to serve.